Step 1 Combine 1 cup of water, the almonds and the garlic in a medium pot and bring to a boil. When the water reaches a boil, drain. Step 2 Pour a fresh cup of water into the pot and add the drained almonds and garlic; bring to a boil. Drain once again. By now the garlic will have lost much of its strength and the almonds will be softened. Step 3Place the garlic and almonds in a blender. Add the mineral water, bread, olive oil, vinegar and salt. Blend until smooth. Step 4Place a colander over a large bowl and line it with cheesecloth. Pour the soup into the colander. Once most of the liquid has passed through the colander, gather the cheesecloth around the remaining solids and squeeze gently to release as much liquid as possible from the solids. Discard the solids. Step 5Pour the soup into a pitcher and chill for at least 30 minutes (several hours is even better). Before serving, if necessary, thin the soup with water to the consistency of cream. Step 6Divide the boquerones into four or six portions. 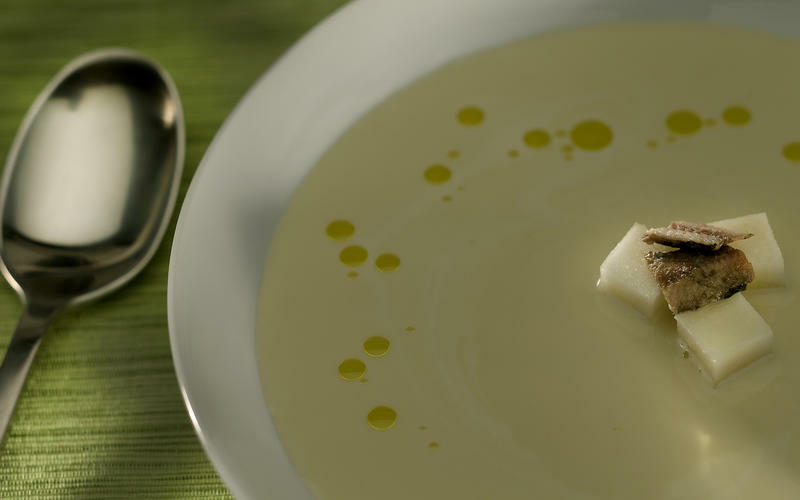 Serve the soup in small soup bowls garnished in the middle with a tablespoon of diced pear and the boquerones, and a swirl of olive oil. In Recipes-list.com we have selected the most viewed recipes from category - . Enjoy the best recipes specially selected for you! Ajo blanco is the right choice that will satisfy all your claims.